Server side rendering is a hot topic when it comes to client side applications. Unfortunately, it's not an easy thing to do, especially if you're not building things in a Node.js environment. Let's review some server side rendering concepts, benefits and tradeoffs, and build a server renderer in PHP from first principles. 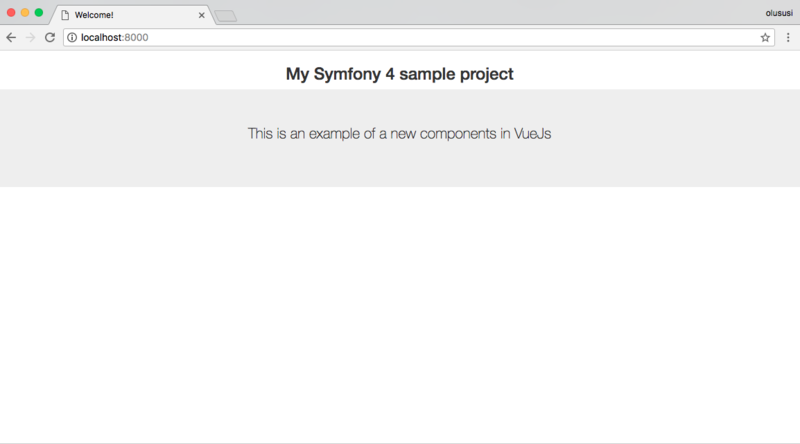 On the CloudWays blog there's a tutorial posted that walks you through the beginning steps to create a Symfony + Vue.js application with a Symfony 4 application. [...] In this article, I will go through the process of enabling and configuring Vue.js within Symfony applications. Part of this process is covered in the official Symfony documentation. The end result is a simple page that shows the component in a Bootstrap-themed page. In order to reduce the burden of invoking the transformation scripts, boilerplate projects have started to include scripts to automatically watch for file changes; and thereafter invoke these scripts. The author (Christopher Pitt) then shows how to create the project and make use of pre-processing and some sample scripts to run tests against. He shows how to set up the test configuration and provides an example test. Finally he includes a script that's used by the "watcher" to recompile the scripts before the tests are executed. To to the watching, he uses the yosymfony/resource-watcher package and a long running PHP script ("watch-test"). On the SitePoint PHP blog they've posted another article from author Christopher Pitt. This time he talks about snapshot testing and if it's a viable way to evaluate code in PHP applications. Ah-ha moments are beautiful and rare in programming. Every so often, we’re fortunate enough to discover some trick or facet of a system that forever changes how we think of it. For me, that’s what snapshot testing is. On the DotDev.co blog there's a recent tutorial posted from Eric Barnes showing you how to combine Laravel Mix and WordPress to make it easier to manage webpack dependencies. He ends the post with some helpful commands you can use while you're in the development process including compiling for both dev and production environments. More information about Mix can be found in the Laravel documentation. The post finishes up covering the integration of the debugger with Xdebug allowing for the complete debugging of your application in one place. Matt Stauffer has posted the latest in his "What's new in Laravel 5.4' series with this new post covering Laravel Mix. Mix is a reworking of the Laravel Elixir package in previous framework releases but has changed a few things up in the process. Laravel Mix. The same and yet entirely different from Laravel Elixir. In Laravel 5.4, Elixir has been replaced by a new project called Mix. The tools have the same end goals, but go about it in very different ways. He starts with a look at what's new about Mix and how it differs from previous version of Elixir. This includes changes in the structure of the configuration file, a different files/folders structure, helpers and quite a few other changes. Matt gets into detail on each item, providing code examples for the changes and a brief summary of how it's different for those that might have used Elixir before. Check out the full post for the full details. A greenfield project might be a good way to try a technology, if the scope is limited and risk in general is low. For many kicking off a new project or undertaking a major rewrite is not an option, but you can still evolve and apply good ideas and fresh concepts in your work. The value of legacy in web development is understated. For each section there's a brief summary of the point and, where applicable, a quick code example or screencast animation showing it in action.